In 1 1/2- to 2-quart container with cover, mix all ingredients; cover tightly. 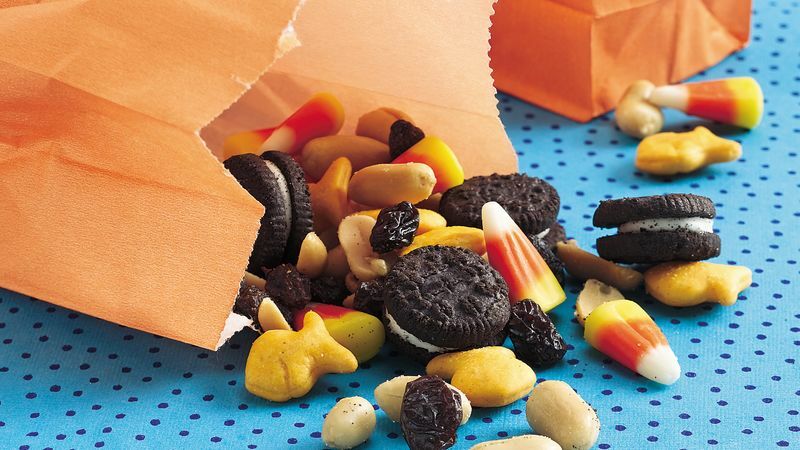 For cute gift bags, buy some small snack-sized bags and black pipe cleaners at the party or craft store. Cut 5 pipe cleaners in half (makes ten 6-inch pieces). Cut 14 pipe cleaners into 4-inch lengths (3-lengths per pipe cleaner). To make each spider, hold four 4-inch lengths together and twist a 6-inch length around the middle of the bundle to secure. Bend 4-inch pieces to look like spider legs. Use 6-inch piece to seal gift bag. Two 4-inch pieces will be left over.